This ear turned out amazing! I was struck with orbital inspiration while styling her ear. I mixed rose and white gold to emphasize there is in fact two rings. Conch is a rose gold pyramid shape. The size fills up that area very nicely. First hole on the lobe is a rg disc with off set black diamond + rose gold back drop. Beautiful!! I love this style of wearing ear jewelry. The jewelry pieces are also very unique. 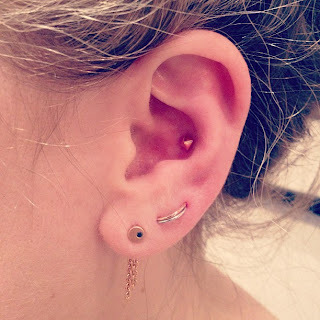 These days there is a huge fashion of piercing body to get a cool look.